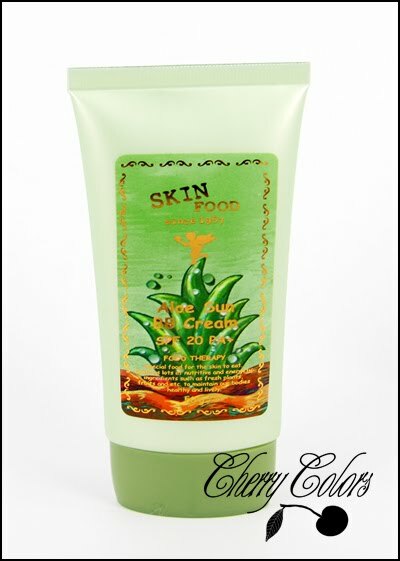 Review: SkinFood Aloe Vera BB Cream - Cherry Colors - Cosmetics Heaven! I have tried all three of the Skinfood BB creams and I must say I love the Mushroom one the most. Here is the SkinFood Mushroom BB review, if you need to refresh your memory :D! Anyway, I got this BB cream from my first swap (and so far last one), and I was really happy about it! I have the #2 because it has a pink undertone to it. I read great stuff about its oil control, so I heard it's really appropriate for combination skin. But let's move onto my experience with it. Texture: Really creamy, a bit thicker. Fragrance: Some gentle semi-fresh smell. I must say that the coverage is well... poor. Sheer to say. But that's OK during summer when I need a lighter thing on my skin. It also has SPF 20 which is always a plus. It spreads easily, even if the texture is a bit thicker than your average cream, but yet very creamy. The fragrance is also very nice. As you can see, I have uneven skin tone, larger pores and here and there some problematic areas (acne). It worked nicely with my combination skin (during summer it's more oily than during winter), and I had to re-blot only once in 6 hours. But sadly it doesn't survive sweating. Not at all! I put it on, went out for a couple of hours (like 2) and when I got back I had no more make up on! It's terrible. I was hoping that a BB cream aimed for the Asian marked would have survived humid weather. +Little goes a long way. -Doesn't stay on all day long. -Oil control isn't THAT good. But after all, it's a good BB cream, especially for those who want just a hint of foundation on their skin and a dewy look. I don't really go for the dewy look during summer, so I always finish my MU with setting powder.